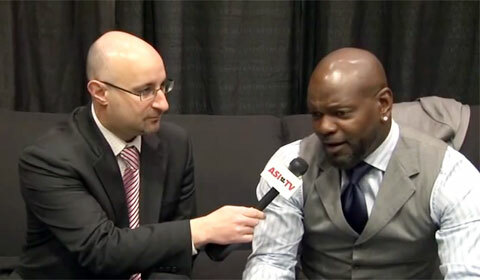 Video shows Emmitt Smith, who was the keynote speaker at The ASI Show in Dallas in February 2013, speaking with counselor editor Andy Cohen after his keynote speech. Emmitt Smith is a retired running back who played for the Dallas Cowboys and Arizona Cardinals for fifteen seasons during the 1990s and 2000s. He is considered one of the greatest running backs in NFL history. If you would like to book football speakers or NFL players like Emmitt Smith for a speaking engagement, autograph signing, guest appearance, product endorsement, celebrity golf tournament, charity fundraiser, VIP meet & greet or special event, contact Emmitt Smith’s agent for speaker fees or call 800.966.1380.